Camping is always a fun adventure, and often a delicious one. But what do you eat when you’re keeping an eye on your health and waistline on a camping adventure? 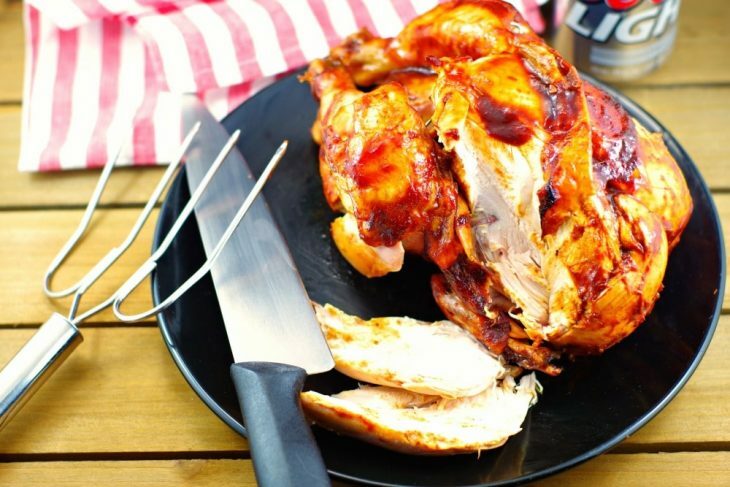 These easy camping meals under 7 points each are going to make your mouth water! 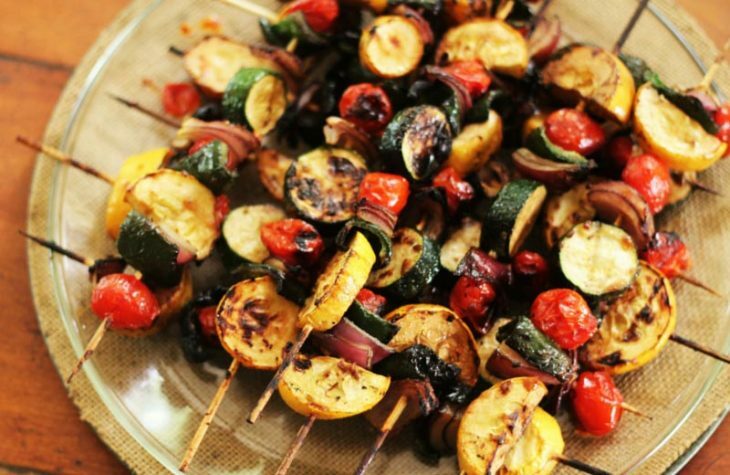 From kabobs to burgers, campfire meals are simple, sizzling, and absolutely perfect for summer evenings! Grilling is the iconic camping tradition, but these delicious meals are not your basic hotdog or hamburger. 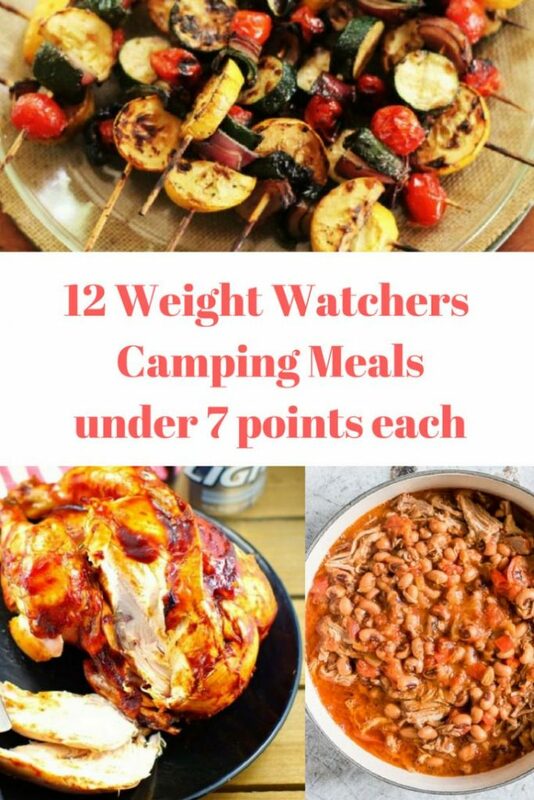 Check out these Weight Watchers easy camping meals for the grill and enjoy the smoky flavor of outdoor cooking while still staying under 7 points each. This recipe is super versatile and if you use boneless skinless chicken breasts and eat 3 skewers, you’ll be at 5 points for your meal. You can’t beat that! Use your chicken, your sauce, and any veggies you have on hand. Summer squash, tomatoes, onions, and mushrooms are delicious here! You can cook these on a grate over the fire, on your grill, or even on a cast iron skillet in your campfire. 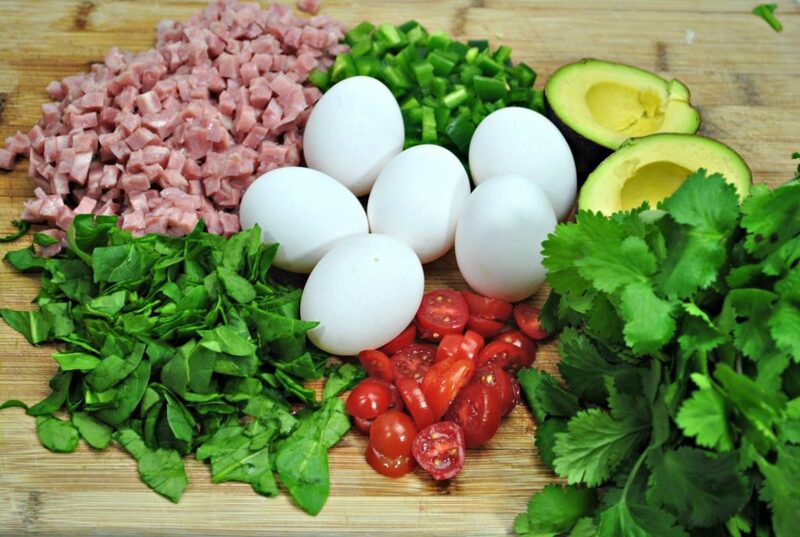 And look at all those delicious colors; this is a meal that’s fun and easy to make and even more fun to serve. At only 1 point per skewer, these grilled shrimp kebabs are a hands-down winner for a way to jazz up your meal over the open fire. Simply add your shrimp and veggies, brush with oil and season with salt and pepper, and you’re good to go. The only problem you’re going to have is all the people trying to grab them as soon as they’re ready! Burgers on the grill are the iconic grilled treat, but too often they’re no good for you (or your waistline!). 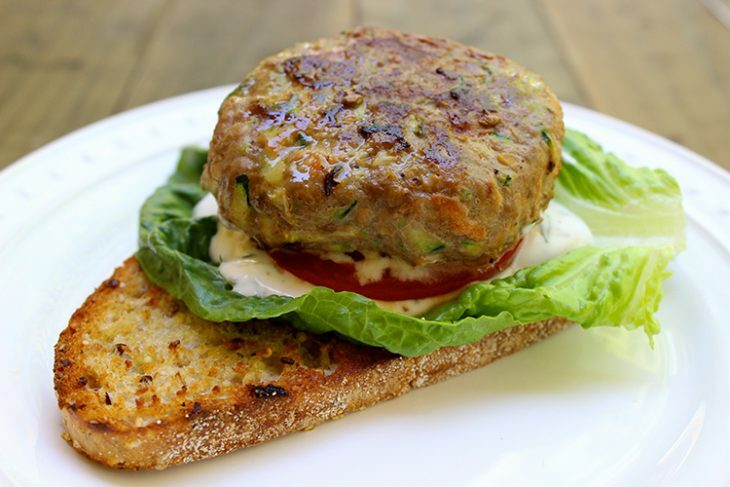 But these turkey veggie burgers are simple and slimming at just 6 smart points a piece! Made with ground turkey and vegetables chosen for the way the flavors will all melt together on the grill, this is sure to be a perfect addition to your camping trip. With grilled boneless skinless chicken breast being a free food, you can pick any one of these marinades and have a meal well under 7 points (really only 1-2 points per meal). The nutmeg-orange one sounds delicious and just made its way onto the “must try this summer list” in our home; which one will you try next? Looking for some heat? Spice it up with Thai seasoning. Great as-is with some grilled veggies on the side or diced up and served in a lettuce boat! This recipe was adapted from the WW magazine a few years back and is so simple. It takes some time to cook, but is well worth the wait! This recipe is a little flexible on points depending on how much BBQ sauce you like to use, but will come in between 3 and 5 points per serving. Cooking in foil packets is a great way to go camping. You can prep the packets before you leave or easily assemble them at your campsite. And clean up is a breeze! Take a peek at this official Weight Watchers Foil Packet Cooking tutorial if this is new to you. These little packets of yum are only 3 smart points a piece! Moist chicken, delicious vegetables, and the ease of cooking in a foil packet on the grill or a skillet in your campfire…what’s not to love? This is a full meal as is, but with a few points to spare you can even add a delicious side dish. These packets are so easy. And they’re not just for the stove top! Bring them camping with you and cook on the fire or the grill. 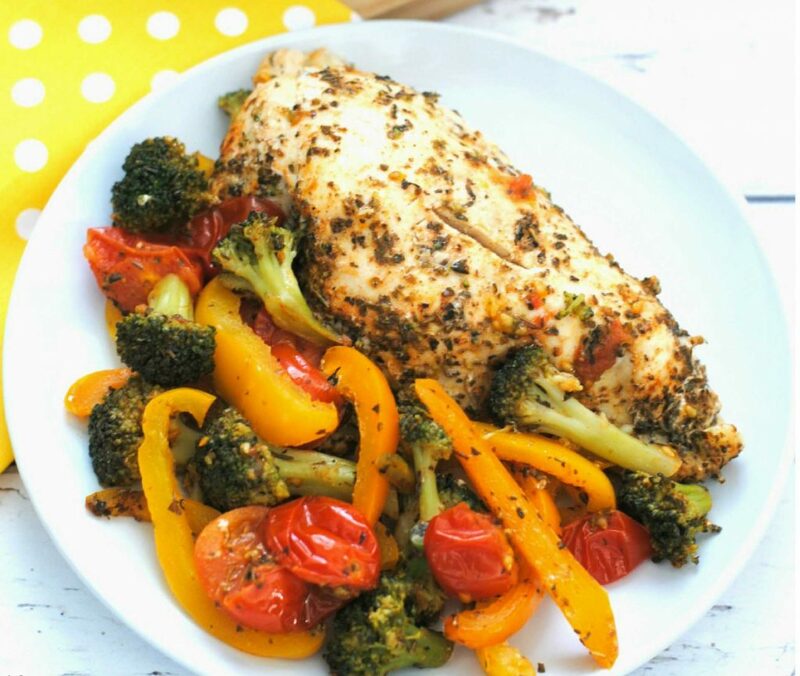 Hungry Girl also throws in a bonus recipe for Spicy Salmon and Veggies, too! Each packet is only 7 points. The beauty here is in the simplicity (only 4 ingredients plus spices!). You dice up your meat, fruit, and veggies, season them, and wrap them up. Really, the possibilities are endless! For even more foil pack ideas, check out this post that is just chock full of ideas. One of the best things about camping is pulling out your deep dutch oven or favorite pot and cooking over the fire. These recipes will help you set your food up to cook and enjoy the fun of camping while it cooks. 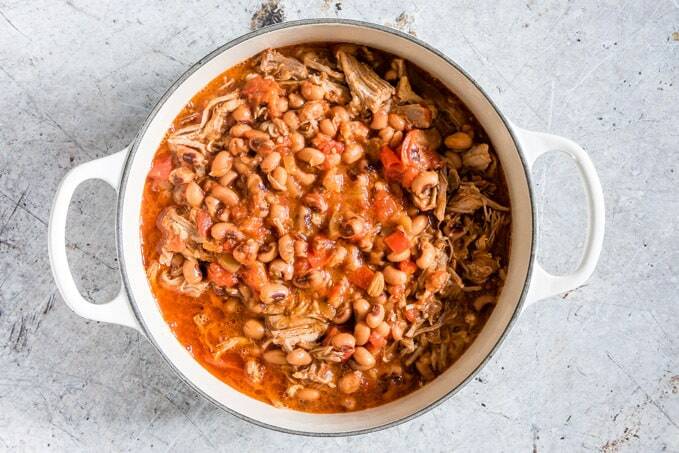 This stew is flavorful made at home, but the richness from the smoke and being cooked over the fire simply take it over the top! Everyone needs to try this at least once. Need a vegetarian option? This stew was created for camping. Made with veggies that are free points, you can keep this as simple as can be! What do you eat for breakfast when you’re camping? There’s the simple oatmeal bowl, piece of fruit, or leftovers…but there’s so much more, too. Here are some simply scrumptious options. These are so good! You can make them up before you head out and simply reheat, or you could make it as a casserole in your dutch oven and serve as slices. Simple, versatile, and a favorite for the whole family. This cooks up beautifully in a cast iron skillet! You can use any meat and veggies you like, of course, so it’s incredibly versatile. These easy jars are made ahead and simple to bring along treats that make breakfast on a camping trip quite easy! At 7 points for a little jar, they are a simple meal to take and make life nice and easy! While you won’t be indulging in s’mores for a delicious treat, you’re not left out in the cold. Skinny on up to the campfire and grill your peaches, plums, pineapples or any other fruit that sounds delicious. Check out this fabulous list of 0-point food to choose from! Need some fruit grilling ideas? This tutorial is loaded with suggestions! So top off your favorite campfire meal with some grilled fruit for a sweet and satisfying conclusion to your night. This post was written by Lisa Yvonne of Graceful Abandon where she writes to encourage women to live lives that focus on their priorities: faith and family (and food! ).